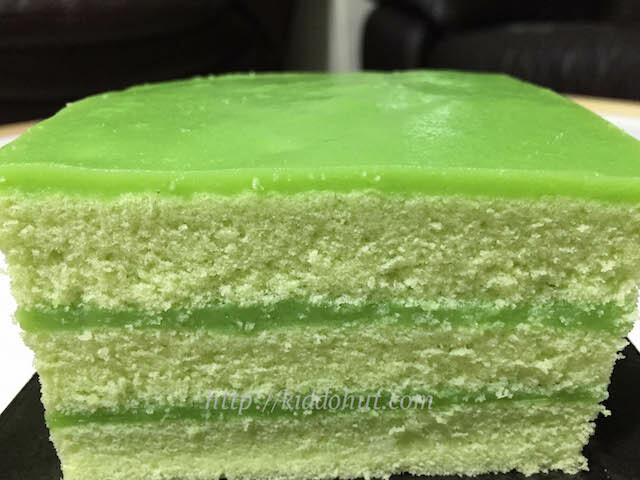 First and foremost, I must apologise for the not-smooth edges of the Steamed Pandan Kaya Layered Cake as I do not have a serrated knife to help me with the job. Not with standing, the look may not be there, the texture and taste are really good. Considering this cake is steamed and not baked, as well as there is no contemplation of wasting egg yolk or looking for other recipes to just make use of the leftover egg yolk or white (because here, you use the whole egg), I would consider this cake to be palatable especially the smooth Pandan Kaya layers. The cake layers remain soft and spongy after chilling it in the fridge for the kaya layers to set. In fact, the cake layers are the recipe for steamed egg cake (鸡蛋糕). Guess what? This is a gluten free cake too! I used rice flour in my recipe and converted it into rice cake flour (simply because I didn’t have any gluten-free cake flour at home). If you have cake flour or low protein flour, just use it on 1:1 proportion. I used the steamed egg cake recipe which I have shared in the blog before, with some modifications not the recipe as I need to chill the cake. I have increased the amount of eggs, replaced the soda water with baking powder and added more cooking oil as the cake tends to dry a little when chilling in fridge. 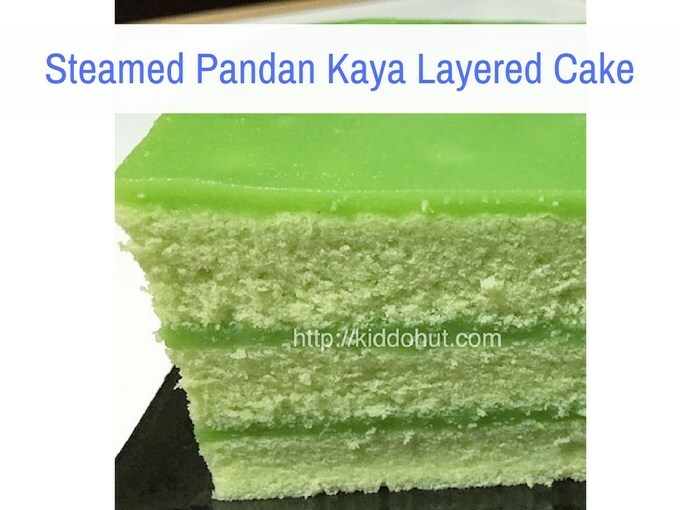 For the Pandan Kaya layers, I used the KitchenTigress’ recipe but modified the ingredients and direction slightly. Use a smaller tin so that you can have a taller cake. If you do not have a cake ring like me, just use back the same tin/tray for assembly. Lay a parchment paper for easy removal. Ensure your desired cake size is smaller than your cake tin/tray as you need to trim the sides after chilling for visual purpose. To ensure flour is folded in properly, fold in flour first then liquid then flour, starts and ends with flour. Do not throw in all the flour at one go. Also, fold the flour by moving the spatular in the pattern of 8. The eggs need to be beaten until light and fluffy before folding in the flour. Otherwise, the bottom of the cake will be denser comparatively and lost the consistency in texture. Lastly, the making of the Pandan Kaya needs to be stirred constantly. So, are you ready to make this tasty and aromatic cake? 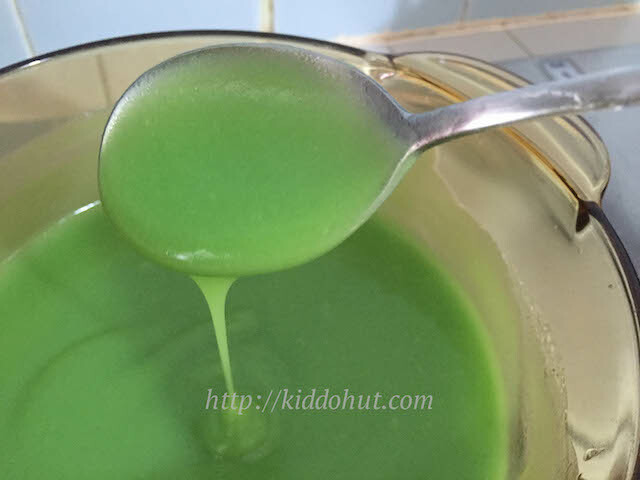 40ml pandan essence/juice - I used 5 pandan leaves, cut to small pieces and blend with 40ml water. Will have extra juice. 1. Whisk eggs and sugar using electric mixer for 3 minutes under medium speed until bright yellow then continue to whisk on high speed for another 10 minutes or until ribbon stage. 2. Prepare the steamer. Add some pandan leaves in the water for steaming for some fragrance. This is optional. Line the aluminium tin with some parchment paper. 3. 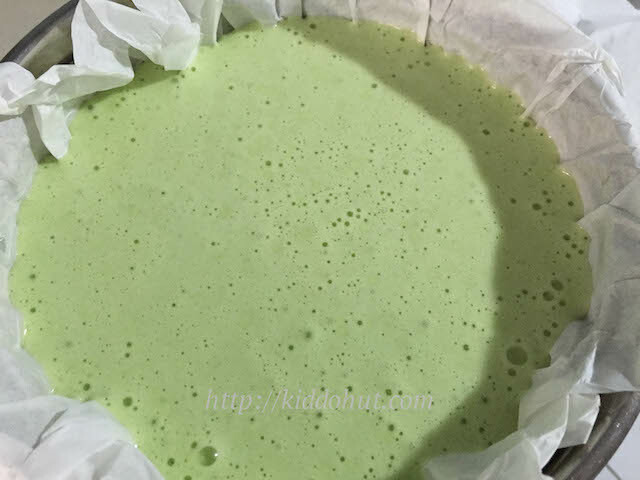 Quickly fold in the 1/4 portion of the sifted flour and baking powder, followed by 1/3 portion of pandan essence and oil, then fold in another portion of the sifted flour. Continue this process until all flour and pandan essence are folded in. This process should be done as quickly and gently as possible. After folding in everything, you will see some bubbles forming. Just knock the tin few times on the table to break some of the bubbles on top. 4. Pour the batter into the aluminium tin laid with parchment paper and steam for 40-45 minutes. Cover the steamer cover with cloth. Test with toothpick, if the toothpick comes out clean, it is cooked. 5. Open the steamer cover and let it cool. Remove the cake from the parchment paper. Slice the top layer of the cake so that the cake will have a flat top (the cake will rise like a dome after steaming). Then slice the cake into 3 layers in equal portion. 1. 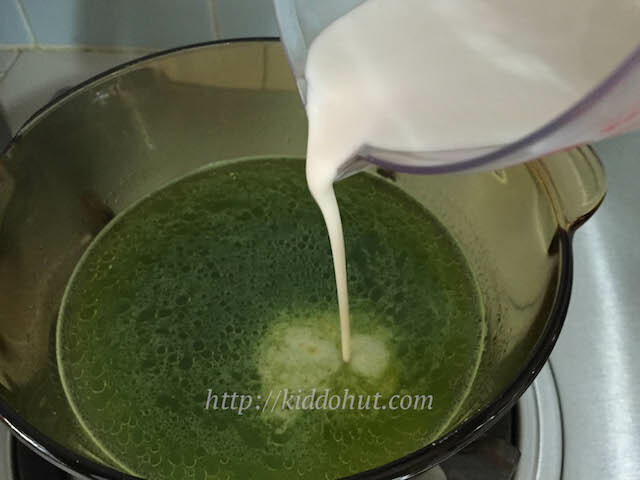 Add hun kwee flour into the coconut milk and stir well to dissolve. Set aside in the refrigerator. 2. Add water into the pot, sprinkle the agar-agar powder and stir well. 3. 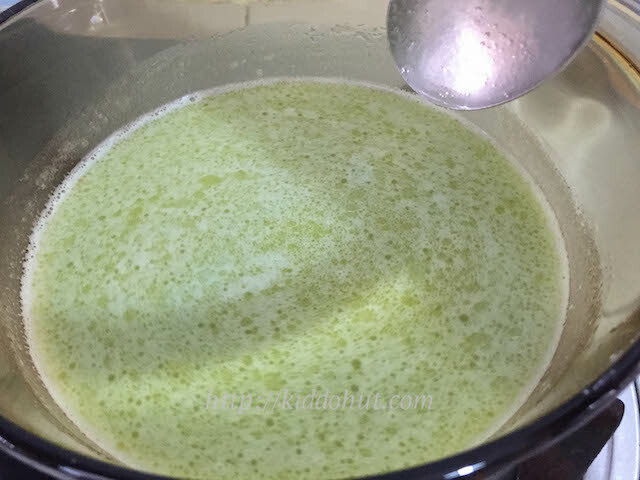 Add Pandan essence, melted butter, sugar and salt into the agar-agar water and stir well. 4. Heat up the mixture. Turn off the heat when the agar agar powder and sugar have dissolved, and the mixture is very hot but not boiling. 5. Add the coconut / hun kwee flour mixture into the agar agar mixture, and stir constantly. 6. 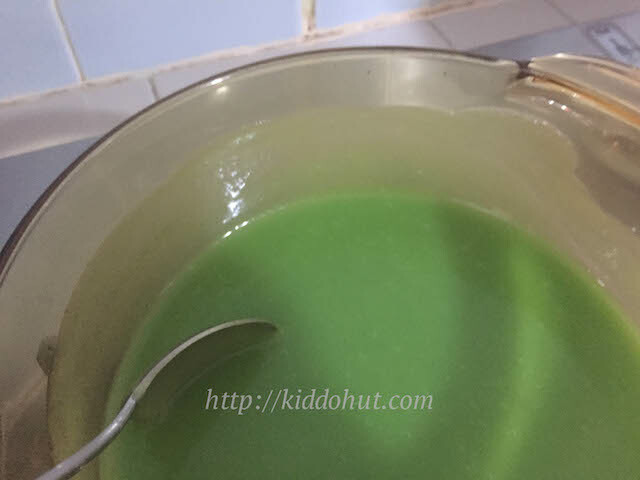 Add the pandan paste and yellow food colouring, and stir well. 7. Heat up the mixture on medium-low heat, stir constantly until the mixture gets thicker in texture. When the mixture is able to coat thinly on the side of the pot, turn off heat and continue to stir until the mixture gets thicker but still able to flow smoothly. 1. Place the top part of the cake in the cake ring or tin with the cut side up. 2. Pour the Pandan Kaya using the ladle onto the cake, and tilt the tin side to side to allow the kaya coats evenly on top of the cake. The thickness is dependent on the amount of kaya you have made. If you have problem trying to gauge how much to pour, split the kaya into 3 portions before pouring. 3. 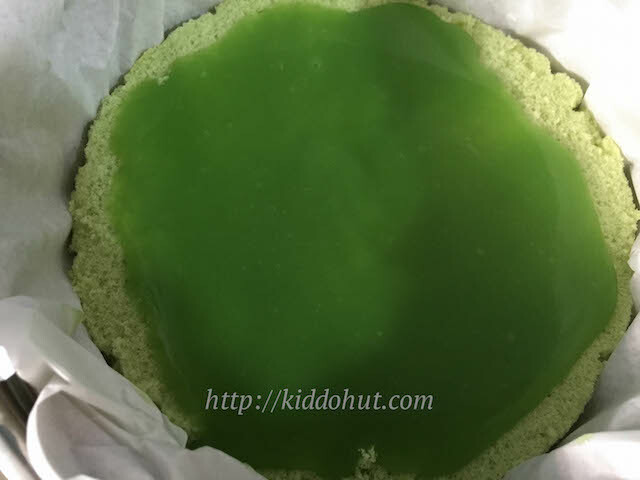 Let the pandan kaya sets for a while, probably a minute, then place the second layer of the cake onto of the kaya. 4. Pour in the second layer of kaya onto the cake. 5. Place the last layer of the cake. and pour the balance of the kaya onto the cake. I have my top layer thicker than the other layers. 6. Leave the cake to cool and chill it in the refrigerator covered. It is ready when the kaya is firmed. To serve, unmould and trim the sides. Sprinkle some desiccated coconut on top of the cake. What is hun kwee flour? do u have a picture of the packaging?